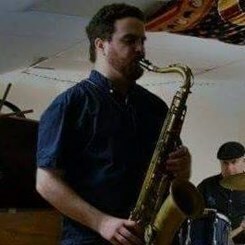 Daniel Wallace is a top-tier horn player who teaches beginning to advanced students the basics of saxophone, clarinet, and flute, as well as jazz improvisation and theory. Daniel has performed with world-famous artists, including "George Clinton and the P-Funk All-Stars" at Artscape in 2015. He has played in bands spanning genres from hard-bop jazz to Gypsy folk; blues to Afrobeat; swing to reggae. This stunning range of experience gives Daniel a rich musical language to draw from while instructing his students. Daniel earned his Bachelors of Music degree in Jazz Saxophone from Loyola University New Orleans. At Loyola, he played in the award-winning "Loyola University Jazz Band 1" where he got the chance to play with top-name jazz artists such as: David Baker, Rufus Reid and Nicholas Payton. Since graduating, Daniel has been playing professionally in various groups including: the hip hop/soul band J Pope and Funk Friday, the funk band Joe Keyes and the Late Bloomer Band, the swing-dance band The New Old Fashioneds, the Gypsy folk band Orchester Prazevica, and the jazz orchestra The Hank Levy Legacy Band. Daniel has also played in several pit orchestras for musicals around the Baltimore area and worked for 7 months on board several Carnival Cruise ships as a showband musician. Request Lessons with Daniel today!